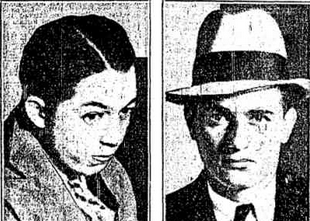 Eighty-five years ago today, Philadelphia gangsters Sam Grossman and Al Skale sat in the office of their second-story gambling and drinking resort, the "Jewish Social Cub." It was located at the south east corner of Girard Avenue and Watts Street. Sam and Al were former lieutenants in gangster Mickey Duffy's gang. Former because Mickey was rubbed out in an Atlantic City hotel the previous summer. Both Grossman and Skale had been picked up as material witnesses and were currently out on bail. Grossman sat at the desk, Skale perched on top. They may have been divvying up the nights receipts as the former had $1,000 in his hand as five armed-men entered the club and headed directly for the office. Once inside the quintet played a hot number with their .38s. No encore required. Police were pretty quick to respond. When they entered the office, they found Grossman keeled over the desk, that grand tight in one fist a gun in the other. His eyes were glazing over but, not wanting to take any chances, a cop knocked the gun from his hand. Skale was blown off the desk and found floundering on the floor amidst $400 in small bills and an ever increasing puddle of his own blood. "[expletive of your choosing] that. I don't know. Get me out of here." Grossman was questioned but either couldn't or wouldn't respond. Both men were taken to the hospital where they died a short time later. Skale (l) and Grossman (r) prior to perforation.